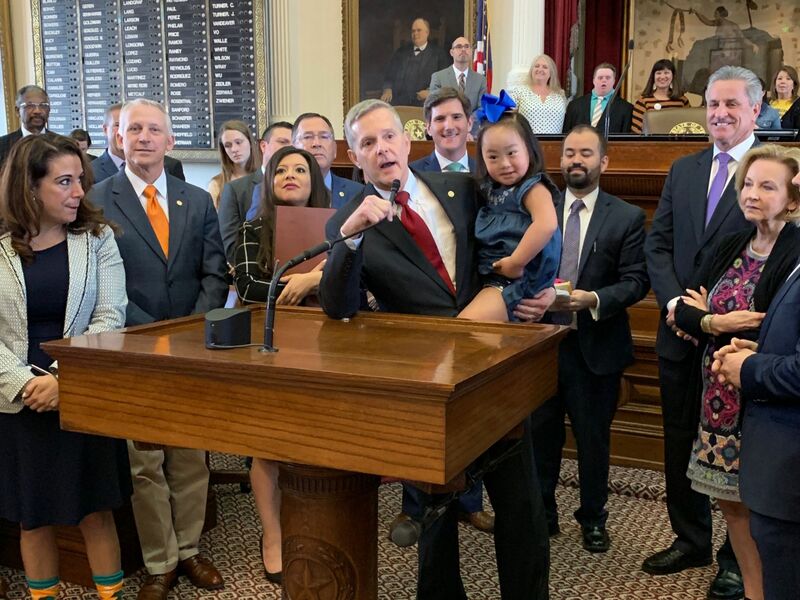 On March 21st, the Texas House observed World Down Syndrome Day to raise public awareness. Individuals with Down syndrome have a third copy of chromosome 21, hence the celebration on 3/21. 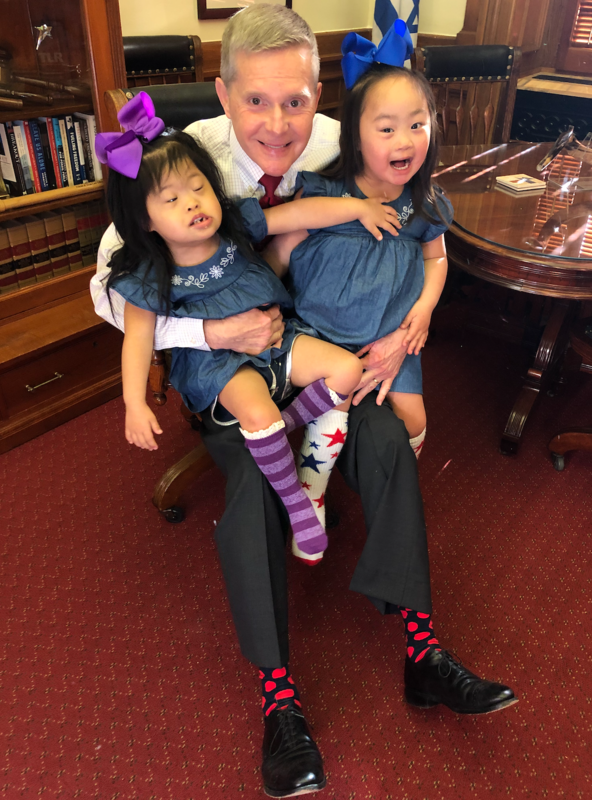 As many of you know, my daughter Sarah and husband Jacob adopted two children from China that have Down’s syndrome. Both Joy and Sunshine joined me on the House floor and enjoyed meeting all of my colleagues. To watch the floor recognition, click on the image below. 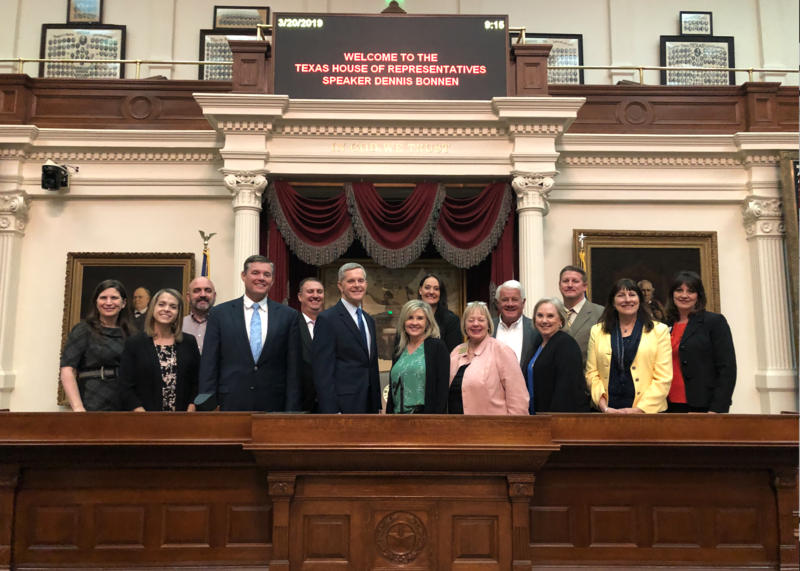 East Parker County chamber delegation spent the day in Austin with a legislative agenda focused on water, education and transportation. They met with stakeholders to receive a legislative update on these important issues affecting the business and local community. 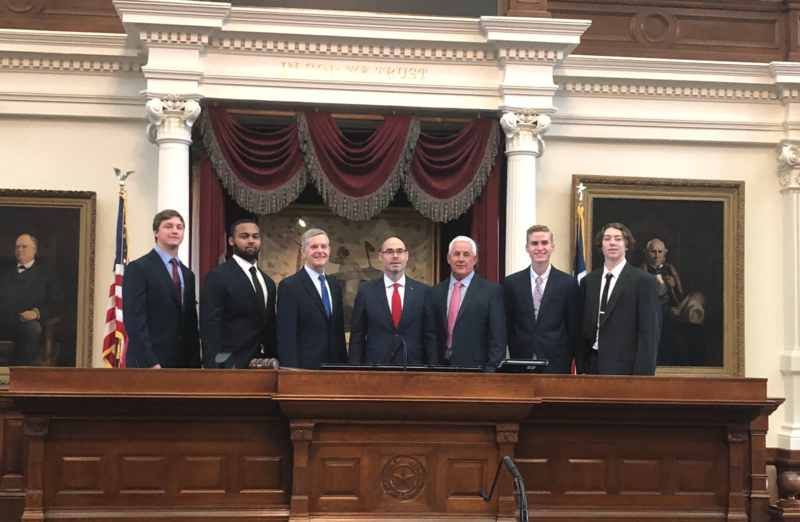 East Parker County Chamber leadership delegation visits Texas capitol. 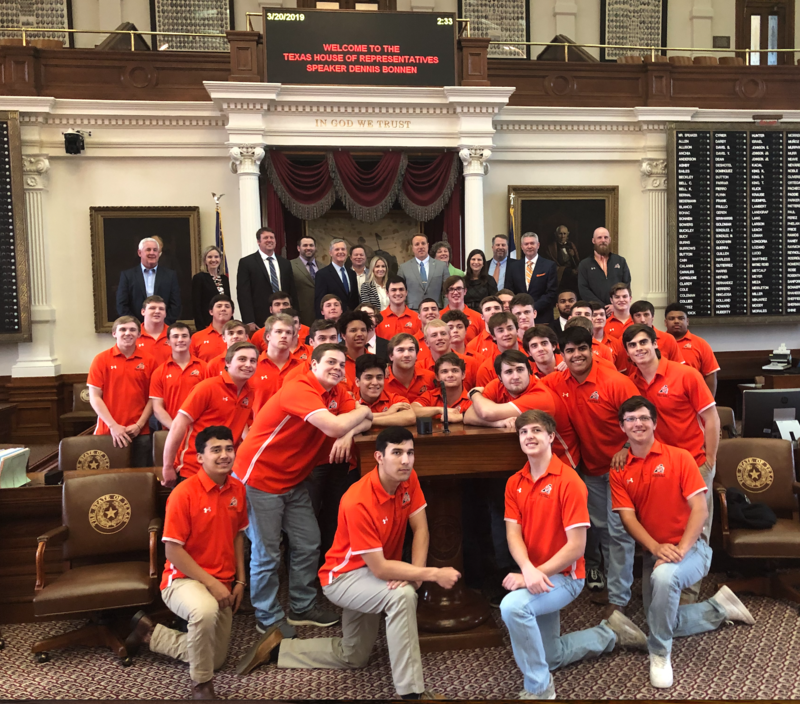 On Wednesday, we recognized Aledo ISD football team for clinching their 8th state championship title in 2018. The team has won the state title 7 out of the last 10 years. We also recognized two other gentleman who received a state championship in cross country and swim. Congratulations Aledo ISD! General Appropriations Bills, otherwise known as the state budget, are introduced by the House and Senate at the start of the legislative session following an assessment of the Legislative Appropriation Requests (LARs) submitted by state agencies over the interim and the Comptroller’s Biennial Revenue Estimate (BRE). The Legislature may change the state budget through a supplemental appropriations bill after the budget has been approved. Because the regular session begins in January, with eight months remaining in the two-year budget period, the Legislature sometimes appropriates funds to supplement an agency for the last fiscal year of a biennium. The Comptroller anticipates state lawmakers will have $119.1 billion for spending over the FY 2020-2021 budget cycle, which is roughly 8.1 percent more funding available compared to the last biennium. The House Appropriations Committee has been hard at work preparing House Bill 1, the state budget for the upcoming biennium, while the Senate recently passed and sent over Senate Bill 500, the supplemental budget which will address the obligations and critical needs of the state in the final months of FY 2019. On Wednesday, the House will be considering both HB 1 and SB 500. HB 1 spends $116.5 billion of general revenue and includes approximately $2.3 billion of funding from the Economic Stabilization Fund (ESF). SB 500 is to fund FY 2019 obligations and includes critical funding for Hurricane Harvey damage. The supplemental appropriations bill spends $2.7 billion of general revenue and approximately $4.3 billion of Economic Stabilization Fund. Comptroller Hegar previously estimated that the ESF would have nearly $12 billion for budget emergencies. Once passed by both the House and Senate, both bills will head to a conference committee between the two chambers, where legislative members of both bodies will then finalize the budget for each chamber’s approval.